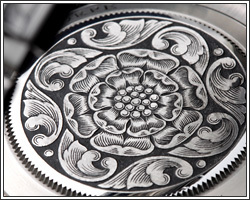 The basic method of hand engraving has not changed for centuries. However, with the advent of modern tools, today's engravers are given advantages that previous engravers did not have at their disposal. Computer technology allows the use of photo editing or vector-based drawing programs, thus facilitating the design process. Using computers and printing technologies, an artist can now successfully and accurately lay out a design from the computer onto the item being engraved. Modern pneumatic gravers are available in the same size as the graver of old, allowing ease of control of the graver cut. 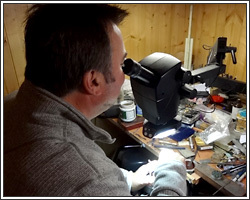 Before beginning the engraving process, the engraver must visualise a design concept, and view the item to be engraved for its shape, its period styling, its value, materials, and contours. There are many things to consider. If the engraving is for a customer, certain boundaries or limitations may arise to suit the customer's price and taste. The item being engraved must be accurately outlined. This can be achieved using a variety of methods. The simplest method is the smoke print. This method involves using the smoke from a kerosene lamp, candle, or equivalent to cover the surface with carbon smoke "inking". The item is held high over the flame so as not to heat its surface. This is important when the item contains non-heat resistant materials. Another outlining method is to use printer's ink over the area. Once the surface has been blackened by smoke or printer's ink, clear tape is delicately placed over the area. When the tape is removed, the smoke or ink remains on the tape, creating the exact shape of the item. An accurate outline is next traced to be used as the design boundary lines. Another method is to use frosted tape laid over the surface, then trace the item's shape with a pencil. This method is less messy, but will take a little longer. In either case, a clearly drawn outline is the base for the beginning of the drawing process. Assuming a design concept has been determined, the next step is to make rough sketches. Sketching continues until the artist has achieved the theme's desired flow. Refinements are slowly introduced, while maintaining the initial feel of the art work. 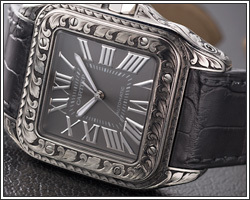 Imagination, creativity and familiarity with engraving styles are important factors. The more time spent creating a design to achieve exactly what is envisioned, the better the final product will be. This also holds true for the quality of the drawing; the better its quality, the better the reproduction will be when reduced to scale for image transfer and layout of the design onto the metal. Designs may also be drawn directly on the item, thereby bypassing many steps. This is possible when a familiar style of engraving is used that has been drawn and cut many times by the artist, or if the engraving is of a less complex design. It is usually best to plan the design on paper, allowing the revisions of drawings at any time prior to the actual engraving process. There are many methods for transferring the design or layout onto the surface that is to be engraved. One is to scratch the design on to plastic mylar which is used to make an ink or smoke print transfer. Another method is drawing with soft lead pencil on mylar, and pulling the lead up with tape, eventually transferring the lead from the tape. Several details must be considered prior to the actual cutting of the pattern. If the engraving is to be relieved, backgrounds will need to be removed, leaving the decorative pattern as a raised or relieved engraving. A precious metal inlay may be part of the design. Gold, platinum, or silver - wire or sheet would be cut and hammered carefully into the desired areas. Both relief and inlay engraving share a common initial step: a design is cut by following or tracing the transferred design?s outlines with the graver. In the case of gold inlay, it must be determined which area of the design will have gold. In those portions of the design, the material will be cut out accurately by graver or dental air drill to a predetermined depth, based on the thickness of the precious metal to be inlaid. This cut out is called a pocket . When the pocket has been cut and levelled to proper depth, a small channel is cut along the base of the inner wall, creating an undercut. This could be called a "dovetail", a term familiar to woodworkers. In this case, the undercut is needed to hold the gold securely in place. The gold, having been cut to fit this pocket, will now be placed in the pocket. Its surface will be carefully hammered, usually with a brass punch. 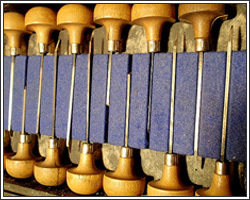 The hammering may be accomplished using a pneumatic air graver and brass punch, or with a traditional hammer and punch method. In either case, the result is the same. During impact, the gold undergoes expansion, spreading into the undercuts of the pocket, which secures it firmly in place. If the inlay is to remain raised above the metal surface, steps are taken in order to calculate the position and shape of the pocket. This is done prior to the inlay by making a smoke or ink print of the pocket for later use. This is a vital step, and cannot be overlooked, since the procedure of inlaying precious metal involves hammering. Hammering, in turn, causes the gold's surface to become mushroomed and cover the pocket?s outline area. 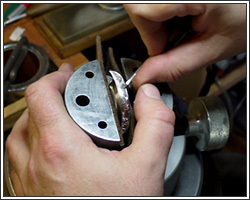 It is difficult to accurately trim excess gold. If too much is trimmed, the gold may lack in the image area, and if not enough is trimmed, the inlay will not fit the pocket shape. This can result in the appearance of a fatter image or inaccuracies where detail is needed. Because an ink or smoke print was taken of the pocket prior to inlaying, this print can be laid over the mushroomed gold to determine exactly where the pocket is located. The next stage involves levelling of the inlay surface. This can be achieved by filing, sanding and polishing to the predetermined height of the image being inlaid. Once the inlay surface is leveled and scratch-free, the gold can be detailed. Detailing may include line engraving, bulino, banknote techniques, or sculpting. The process is somewhat easier if the gold inlay is to be flush and level with the base metal surface, since there are no difficulties with mushroomed gold and pocket position. The surface is simply filed, sanded, and polished flush. 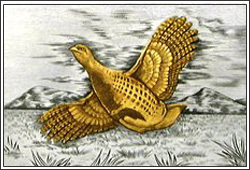 Relief engraving is simpler by comparison to inlay work, and only requires the removal of background around the design. This is accomplished by cutting away the metal background and leaving the decorative motif design in the foreground. The cut out background may be decoratively punched to create a matted textured, or it may be lined to create interesting light reflection effects. There are several methods in which the background may be detailed. Some of them are punching, stippling, lining, and beading. Having accomplished the above, detailing of the decorative motif will begin. This step is labelled as shading. Shading is the process by which multiple, tightly grouped fine lines or dots are applied in order to achieve light-to-dark contrasts. This defining step can raise or lower the overall quality of the engraving. Correctly produced, it will add life to the art. If shading is not fully understood and expertly executed, however, the engraver runs the risk of lowering the quality of his previous efforts. Shading is the highlight of quality engraving, and is perhaps the most difficult area for the beginning and intermediate level engraver to develop proficiency. Collectors who recognise quality engraving examine the shading and look for precision, continuity, and character in the shaded areas.